Acupressure uses the same points as acupuncture but uses the application of pressure from fingers/thumbs. I generally combine a deep tissue massage with acupressure. Heat is applied to an acupuncture point or meridian using moxa and/or heat lamps to warm and relax muscles. Moxa is sometimes used as part of an acupuncture or acupressure treatment. 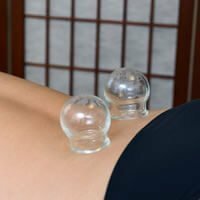 Glass cups with a vacuum seal are placed on the skin to stimulate blood flow and clear stagnant qi. Again I use this technique, if appropriate during acupuncture or acupressure treatment. Vigorous rubbing of the skin increases blood flow and clears stagnant qi. Again I use this technique, if appropriate during acupuncture or acupressure treatment.